A few days back news broke that the European Union had fined Google a massive $5.04 Billion, that would end up making for a big hit on the company’s earnings this quarter. Well, Google’s parent company Alphabet Inc. (NASDAQ:GOOG) just posted its second quarter results and the impact did make quite a huge dent in the company’s Net Income/share available to shareholders. 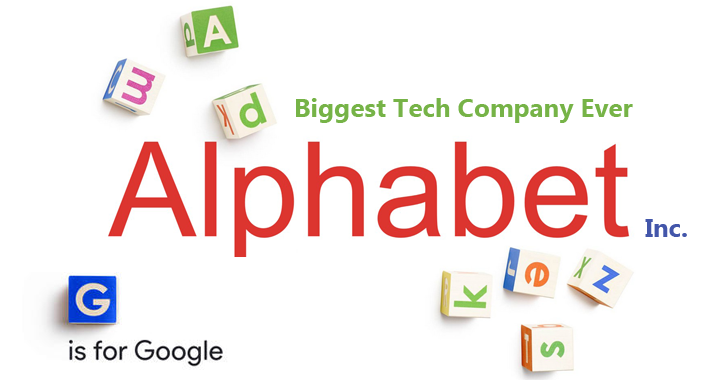 Wall Street had expected Alphabet’s Revenue to stand at $25.6 Billion and Earnings Per Share at $9.64. Alphabet also continues to play its role as a major tech investor; a fact that’s also reflected in its strong EPS gains (if we exclude the impact of EC’s fine). 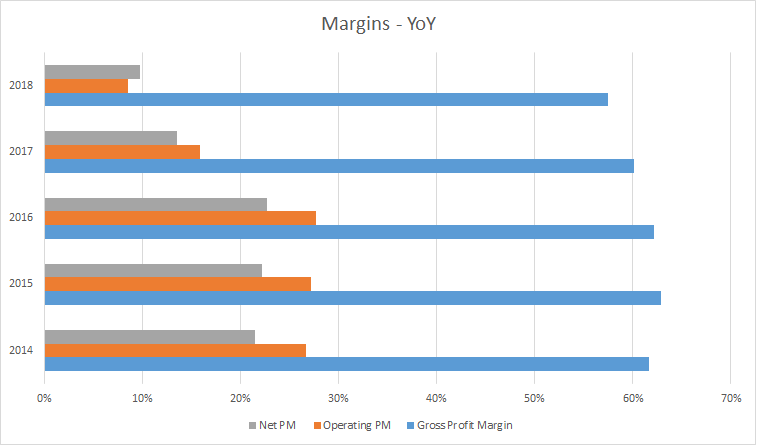 So how well did Google’s parent company perform this quarter? Let’s take a detailed look. Alphabet Inc, Google’s parent company has had a fantastic quarter if we look at its revenue. Alphabet reported Revenue of $32.6 Billion this quarter, a sequential gain of $1.5 Billion. However, this was not translated into the company’s GAAP Net Income due to the $5.04 Billion EC fine. Alphabet’s Net Income for the quarter is $3.2 Billion, marking or a $6.2 Billion sequential decrease. Net Income per share stands at $4.75, representing the full impact of this aforementioned fine. Without it, Alphabet Inc would have reported Net Income of $6.3 Billion, making for an approximate $3.1 Billion sequential decline. Considering trends over the past five years, Alphabet’s revenue generally grows in the second quarter and this year’s no different as the company earned $6.6 Billion more this quarter. Another metric for Google that performed below market expectations but grew over the year is the company’s TAC (Traffic Acquisition Cost). 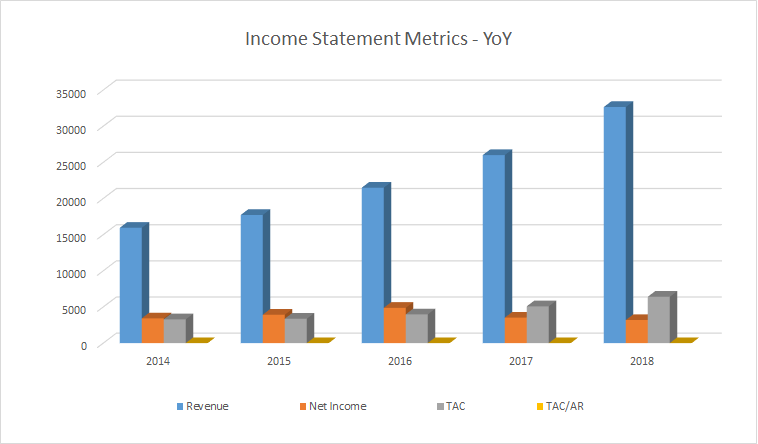 TAC stands at $6.4 Billion growing by 26% yearly and by $132 million sequentially. However, Google’s TAC-to-Advertising Revenue ration fell by 1%, indicating a slight improvement in efficiency. Google also reported a 58% growth in paid clicks but a 22% decrease in the amount paid per click, reflecting an increase in low-revenue clicks. Google’s partnership with Target for cloud services and its other revenue sources such as Pixel smartphone and Chromebooks contributed to a strong growth in ‘other revenue’. Alphabet Inc (NASDAQ:GOOG)’s Other Bets continues to make a minute portion of its overall revenue as it marked for only $145 million in cash generated with a $103 million yearly decrease. Finally, Google’s increased emphasis on Cloud, Wymo, Fiber, and others is reflected in a 15.6% Capital Expenditure increase, with the Q2 value of $732 million. Alphabet Inc. reported a $1.06 Billion gain on securities this quarter, as Alphabet continues to play a dominant role in tech investments. The group’s investments sprawl across a wide number of industries, from human resources to biotechnology. Last quarter, Alphabet’s stake in Uber reflected a $3 Billion gain from equity securities in its Other Income segment.